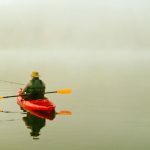 With the advent of kayaking going mainstream, no longer reserved for niche fishos used to spending their weekends exploring Australia’s backcountry waterways, kayaks are becoming more and more complex. 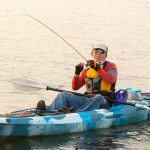 There is a magnitude of kayak designs and materials available these days, and the same applies to kayak trailers. When you take the plunge and buy your first kayak, you will need to invest in a good trailer or roof rack for transportation. I used to use roof racks but now I prefer trailers for the sole reason that you don’t have to mess about lifting the heavy kayak on and off your roof, especially if you store items in the kayak during transportation which inevitably fall on your head when unloading. A trailer makes loading and unloading the kayak much easier as it transports it at a more manageable level. My age is starting to show. But we all have this to look forward to, so I have learnt to embrace the things that make my camping trip easier. 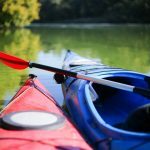 You can now find trailers that will fit up to 16 kayaks, but for most people space for one or two will be sufficient. The first decision that needs to be made is how many kayaks you will be transporting. Most single trailers are made for a solitary 12ft kayak, but you can buy larger trailers and then put storage boxes in the extra space to give more storage space for your camping trip. Just bear the weight distribution in mind when loading your storage boxes. You want to ensure the weight in the trailer is evenly distributed or it could pose a problem when travelling at high speeds. Most modern trailers are constructed from aluminium. If you are buying an older second-hand trailer it might be made from steel. The aluminium trailers may cost more upfront but are worth it in fuel consumption. 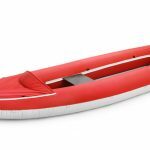 They are lighter than their steel counterparts and if you are hauling more than one kayak, the extra weight will have a significant impact on your car’s fuel consumption. Aluminium also requires less maintenance as it is more resistant to corrosion. The weight of both the kayak and the car should also be considered. The single trailers can tow around 900lbs of weight. If you are looking for something bigger, to transport more kayaks, you will need to consider the size of the car. If you need to transport 12 kayaks and the total weight is around 1600lbs, you need to make sure the car has the engine capacity for it. There are lightweight trailers available. These are often made from T6 aluminium and can support multiple kayaks despite being extra lightweight. These are particularly good if you reverse to the water source and unhook the trailer to unload the kayaks. With a lightweight trailer, you will have much more control over the trailer when wheeling it around. What do you think? Have you recently bought a kayak trailer? Share your thoughts through the comments section below.